Size: Standard size is 13 - 18lbs when full grown. Many Cavaliers these days grow to well over 20lbs, and are prone to becoming overweight. It is important to keep your Cavalier at a proper and healthy weight. Temperament: Eager to please, happy with a characteristic tail wag - always in motion, active when engaged, lazy if allowed to be, without training can be prone to separation anxiety. With a sporting dog background, they have chasing and hunting instincts and should NOT be trusted off leash, as they can easily get distracted chasing a bird into a busy road. Generally, they get along great with other animals and dog-savvy children. Grooming: Requires at least a weekly brush out. They do shed but not as much as double coated breeds. They will need a full bath every 4 - 6 weeks, and rinsing or spot washing in between, usually their feet and rear ends. Traditional show coats are not trimmed at all except for the paw pads and sanitary regions. Shaving the coat is not recommended unless medically necessary, as when the coat grows back the undercoat grows back in faster than the topcoat, resulting in a difficult to manage, thick, messy coat. Trimming the coat shorter is fine for pets. Exercise: 20min walk daily and/or playing ball in the yard. They don't require tons of exercise, but need some. Young puppies have a lot of energy, and generally begin to mature and calm down by about 10 months - 1 year old. Males vs Females: Sometimes females are slightly more independent than the males are. Males generally are a bit larger in size. Otherwise there is not much difference between the genders. 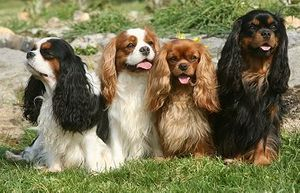 A properly bred Cavalier will have an amazing, loving, outgoing personality, the level of which will depend on a combination of their genetics, how they were raised with their dam and the breeder, and how they are raised in their new pet home. Every dog is an individual. I highly recommend early group obedience classes for all my puppies, for socialization purposes.